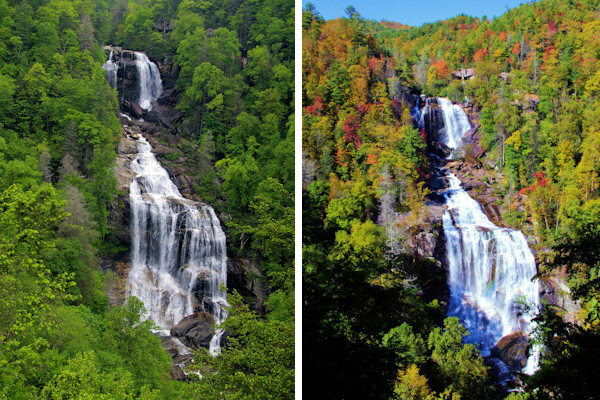 Whitewater Falls is the highest waterfall east of the Rockies, falling 811 ft.! 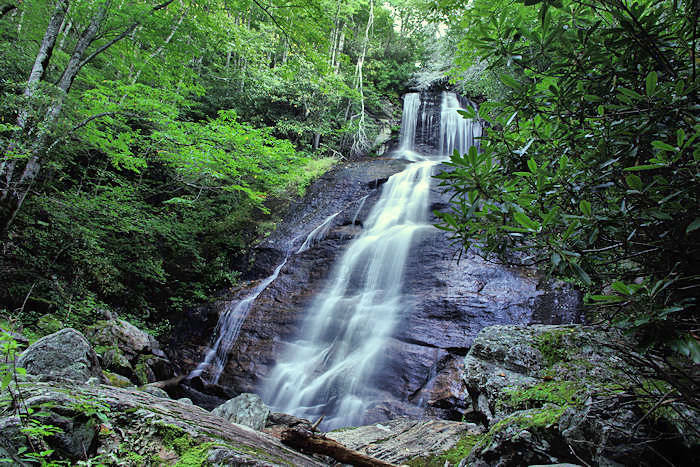 The Upper Falls plummets 411 ft. and is 60 miles from downtown Asheville in the Nantahala National Forest. It's on the Whitewater River in the Jocassee Gorge area of North Carolina - in Jackson County. 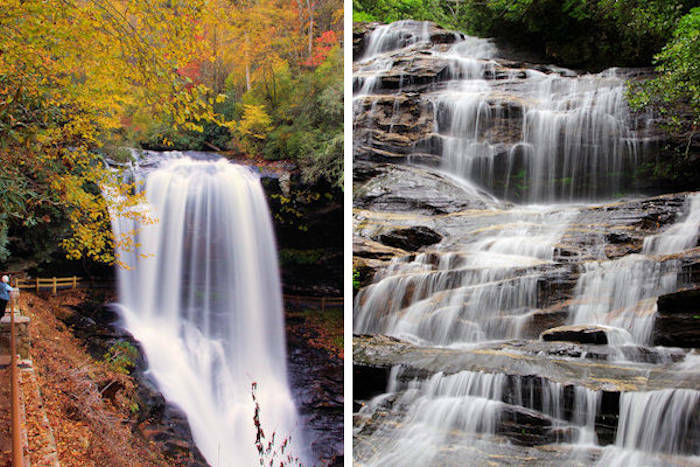 The 400-ft. Lower Falls can be accessed from a different location in South Carolina. 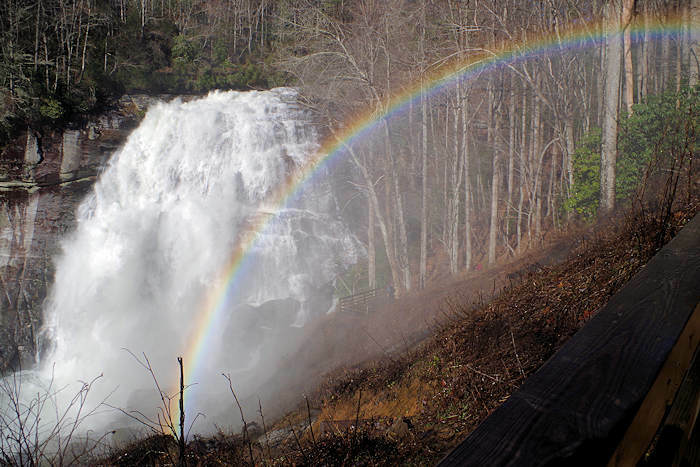 For an excellent view of Upper Whitewater Falls, follow the paved 1/4-mile walkway to the upper overlook. The walkway begins at the end of the parking lot and is accessible to wheelchairs. A lower overlook with an even better view (photos above) is located at the bottom of 154 wooden steps. The only full views of the waterfall are from these two overlooks. However, some people venture off the trail to try for better views. Tragically, several of these people fell to their deaths or suffered serious injuries at Whitewater Falls. Please stay on the trails. More energetic hikers can continue down the half-mile spur trail that drops 600 ft. in elevation to the Whitewater River and Foothills Trail. It's a nice spot to swim and hang out on the big rocks. Once down the set of stairs, the trail switchbacks down the mountain and is steep in places. It will be very slippery on a wet day. Cross the metal bridge and take the path to the left towards the falls. To the right is the Foothills Trail which will take you down the river, past the base of Corbin Creek Falls, and into South Carolina. The trail towards the falls is rather treacherous and hard to follow in places. Many times you'll see a rainbow in front of the waterfall caused by the mist and the just-right sun angle. Fee (honor system): $2 for vehicles with seven passengers or less. No camping. The parking area for Upper Whitewater Falls is large and includes picnic tables and restrooms. Directions From Asheville: Take I-240 West to I-26 East. Go to the Asheville Airport/Brevard Exit (exit 40) and take a right onto NC 280. Drive to Brevard and take US 64 West (toward Lake Toxaway and Highlands). 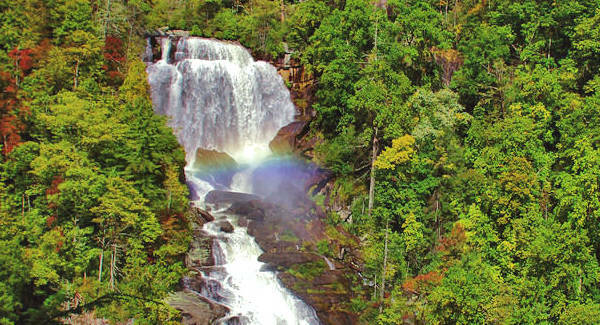 At the community of Sapphire, turn left on NC 281 and go south about eight miles to the Whitewater Falls entrance. You will pass the entrance to Gorges State Park with more waterfalls, including Rainbow Falls. See more things to do in Jackson County. 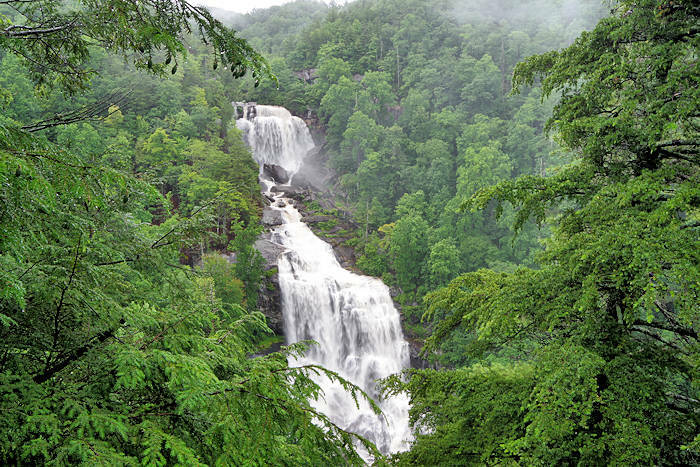 Just a few miles downstream in South Carolina is Lower Whitewater Falls that cascades 400 ft. down a rock face in the Jocassee Gorges area. 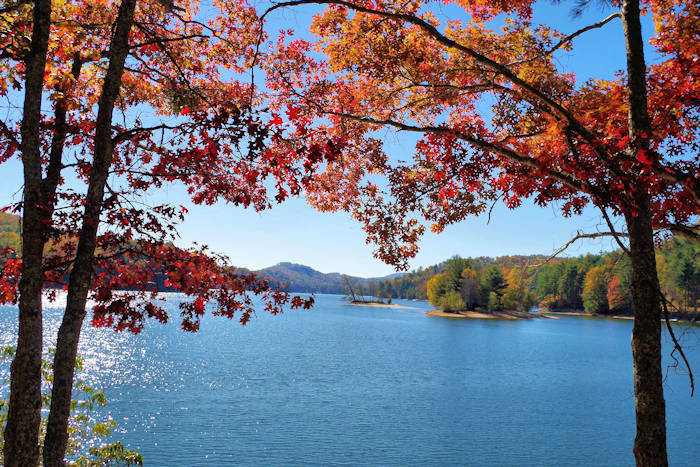 The two-mile trail to the falls overlook begins at Duke Power's Bad Creek Pumped Storage Project north of Lake Jocassee.